As World War I reaches the heart of the African jungle, Charlie Allnutt and Rose Sayer, a dishevelled trader and an English spinster missionary, find themselves thrown together by circumstance. Fighting time, heat, malaria, and bullets, they make their escape on the rickety steamboat The African Queen…and hatch their own outrageous military plan. Originally published in 1935, The African Queen is a tale replete with vintage Forester drama – unrelenting suspense, reckless heroism, impromptu military manoeuvres, near-death experiences – and a good old-fashioned love story to boot. Most famously, perhaps it became a 1951 film directed by John Huston and produced by Sam Spiegel and John Woolf and starring Humphrey Bogart as Charlie Allnut and Katharine Hepburn as Rose Sayer. Unable to provide an English (or more specifically, a Cockney, accent, Bogart’s Charlie Allnut was re-cast as a Canadian, and Bogart went on to win his only Oscar in the role – picking up Best Actor in what he regarded as the best performance of his film career. On Sunday, May 27th, 2018 at 13:30 SLT, join Corwyn Allen, Kayden OConnell, and Caledonia Skytower at Ceiliúradh Glen, which has been redressed as German East Africa as they present The African Queen, combining both novel and film script. 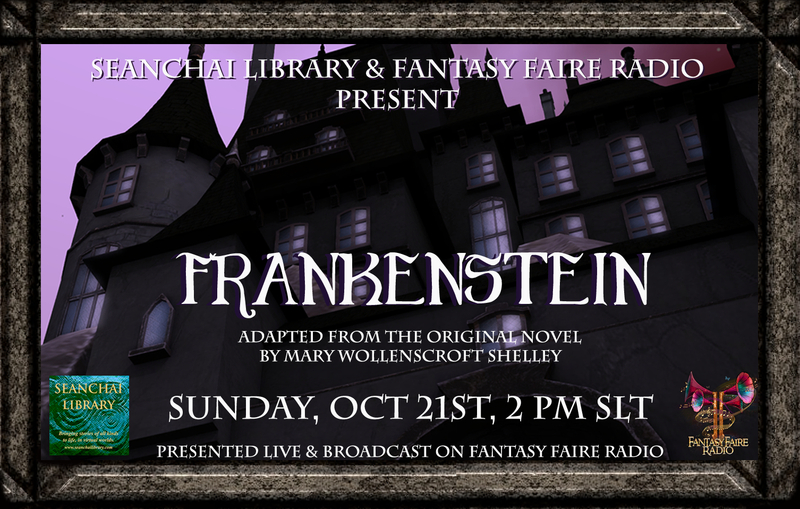 Join us on Sunday, October 29th from 12:00 noon SLT, as Seanchai Library presents an afternoon of Halloween stories live in voice, followed by devilish music and dancing. From noon Seanchai Library and Friends gather round the autumnal fire to share ghostly adventures – tales of the weird and unexplained. Then at 2:00pm SLT DJ Joy Canadeo rocks the terrestrial plain, and the “beyond” with great tunes among the spirits. Grab a ghostly friend and join in the dance! The event is in support of Feed A Smile, Holly Kai Park’s adopted charity, and will take place at Haunted Holly Kai, a suitably spooky setting courtesy of Pandemonium. Feed A Smile is a programme run by Live and Learn Kenya (LLK) to provide nutritious warm lunches for over 400 children every day, paid for entirely from donations to the project. It is part of a broader programme managed by LLK, which includes finding sponsors to finance the education of children in Kenya, helping to provide them with everything they need: uniforms, shoes, text books, school supplies, etc., and the building of the Nakuru school, Kenya. Haunted Holly Kai (Holly Kai Estates, rated: Moderate) – or use any of the teleport mirrors to by found at the landing points across the park. Here’s all that is going on at Holly Kai Park between Sunday, October 1st Friday, October 6th. This week: The Adventure of the Lions’s Mane. Get over the mid-way hump with 90 minutes of music, dance and conversation as Caitinara Bar hosts our regular mid-week session with Gerrard Winstanley. Faerie Maven-Pralou reads Kei Meyer’s tale of magic. Shandon Loring reads selctions Shadows is a series of eleven horror anthologies edited by Charles L. Grant and published by Doubleday between 1978 and 1991. This week: Mrs Clendon’s Place by Joseph Payne Brennan, and The Haunting by Susan Casper, both of which appeared in Shadows 7 in 1984. Contemporary science fiction with Finn Zeddmore. Get your weekend of to a good start in the company of DJ Joy Canadeo, the Joyriders, and 2 hours of music, fun and conversation at the *new look* Caitinara Bar! Here’s all that is going on at Holly Kai Park between Sunday, September 10th and Sunday, September 17th. Gyro Muggins reads Ursula K. Le Guin’s first Earthsea Cycle. Join Kayden Oconnell for true tales of bigfoot, werewolves and other legendary creatures! Corwyn Allen reads Spider Robinson’s 1999 anthology. Shandon Loring reads Daphne du Maurier’s tale of a lonely young man and his femme fatale. Here’s all that is going on at Holly Kai Park between Sunday, September 17th and Friday September 22nd 2017. Sunday, September 17th: Pirate Sunday! A special event to mark International Talk Like a Pirate Day, 2017. Take the teleport up to Seanchai Library’s pirate cove, where Kayden Oconnell, Aoife Lorefield, and Caledonia Skytower will regale you with tales of the skull and crossbones, cutlasses, treasure and more from the wild days of yore on the high seas! Those enjoying the tales are invited to teleport down to The Pavilion at Holly Kai Park, which has been specially transformed into the Pirate Docks, where the music will flow for two hours and everyone (and their friends! Invite the all!) can dance the time away, quaff the grog, walk the decks (or plank! ), shiver their timbers – and even fire off a cannon or two! And if have a boat, why not sail over and enjoy the fun! Pirate Sunday benefits Feed a Smile, supporting a school in Kenya founded and run by Brique Topaz 16 years ago through her German-based Live and Learn in Kenya charity. 100 Lindens equals approximately 30 cents in real world currency, which pays for one child’s meal. One third of all money raised for each month’s food budget is collected through donations made in Second Life – so, that’s another reason to come along! Selected adventures from R. Crap Mariner’s “George Canon” of 100-word stories (aka “drabbles”). With Corwyn Allen, Faerie Maven-Pralou, Kayden Oconnell, and Caledonia Skytower. An original tale for a special “Late Night” on this special day, presented by the author, Matthew Howard. Get your weekend of to a good start in the company of DJ Joy Canadeo, the Joyriders, and 2 hours of music, fun and conversation at Caitinara Bar! September 17th: Pirate Sunday with Seanchai Library! Second Life – They are dusting off their cutlasses, refreshing their command of “The Code” and getting ready to celebrate an event that marks the beginning of the “High Story Season” for one of Second Life’s oldest spoken word programs – now in its tenth year. Seanchai Library will celebrate International Talk Like a Pirate Day with Pirate Sunday on September 17th beginning at 1pm at Holly Kai Park, followed by music and dancing across the region at the Holly Kai Park Pavilion. Seanchai Library is launching the season in style this week: presenting a schedule littered with swashbuckling tales, and offering its second annual Pirate Sunday featuring 90 minutes of salty adventures live in voice with Kayden Oconnell, Aoife Lorefield, and Caledonia Skytower. At 2:30pm festivities will shift over to the Holly Kai Park Pavilion (just a teleport away by the on-island system) for music and dancing. The Pavilion is easily accessible to vessels enjoying the Blake Sea, and residents are invited to sail by and drop in to shake their swashbuckling money-maker. Pirate Sunday benefits Feed a Smile, supporting a school in Kenya founded and run by Brique Topaz 16 years ago through her German-based Live and Learn in Kenya charity. 100 Lindens equals approximately 30 cents in real world currency, which pays for one child’s meal. One third of all money raised for each month’s food budget is collected through donations in SL at The Lavender Fields where musicians perform in support of the children. Seanchai Library will follow-up Sunday’s festivities on Tuesday, September 19th (the day itself!) with two back to back story sessions featuring the piratical works of writers active in Second Life. At 7pm “Pirate George Night” will feature selections from R. Crap Mariner’s canon of 100 word stories – known as “drabble.” Just over a year ago Mariner began writing pieces which began with the line “George was a pirate, but he wasn’t a very good pirate…” and the rest is history. Members of the Seanchai staff will bravely share George’s various pirate adventures, selected randomly from the “George stories,” and read “cold” – with no advanced preparation. At 8:30pm, author Matthew Howard will share an episode from his own canon of works featuring an interstellar female pirate in 2029 – Meteor Mags. In “Hang My Body on the Pier”, the heroine recalls the exploits of her great-grandmother, who rose from a disguised ship’s boy to a Pirate Queen, connected to the legends by a song. Author Howard will present the story himself, live in voice. International Talk Like a Pirate Day is a parodic holiday created in 1995 by John Bauer (“Ol’ Chumbucket”) and Mark Summers (“Cap’n Slappy”), of Albany, Oregon, U.S., who proclaimed September 19 each year as the day when everyone in the world should talk like a pirate. The holiday, and its observance, springs from a romanticized, and comic view of the Golden Age of Piracy. According to Summers, the day is the only known holiday to come into being as a result of a sports injury. During a racquetball game between Summers and Bauer, one of them reacted to the pain with an outburst of “Aaarrr!”, and the idea was born. Holly Kai Park is rated Moderate.